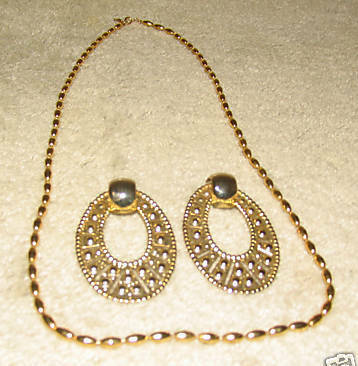 This is a Vintage Goldtone Napier Necklace with Matching Hoop Earrings (these earrings are not Napier but match well); probably from the '80's These are from an Estate Sale may be 30 years Old. I am not a Jewelry Expert, just a Jewelry Lover. Jewelry is Vintage, Costume, Pre-owned so some wear from use should be expected. All Jewelry has not been cleaned or polished, that is left to buyers. Please check as I begin to list my Entire Collection... Returns are accepted ONLY if Item is Not as Described. The Buyer will pay all Shipping Costs. Shipping is via First Class Mail Jewelry will Ship Immediately upon receipt of payment thru PayPal. International Shipping will vary by country. Please inquire about International Shipping Rate Prior to Payment... I will ship Worldwide; however, if your country charges a customs charge, you will be responsible for the charge. Included here: 1 Napier Goldtone Necklace with Matching Goldtone Hoop Earrings for Pierced Ears (no markings on earrings so not Napier). Please let me know if you have any questions. All enquiries are answered promptly. Thanks for looking!